Library services in Sidney began as part of the public school system in the early 1800’s. However, it was not until 1955 that the Sidney Memorial Public Library building on the corner of River and Main Streets was completed. That original building now houses the Children’s Area of the library after a 1994 expansion that connected the building to the recently vacated Post Office next door. Then in 1996 the Sidney Memorial Public Library received generous donations from the estate and trust funds of Fred and Irene Smart. With these funds the library added the addition of the Fred & Irene Smart Community Room. The Sidney Memorial Public Library is a School District Public Library. Voters within the Sidney School District vote on the library’s annual budget and support the library with their taxes. 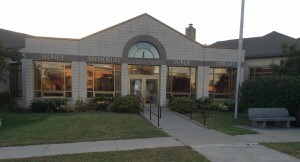 The Sidney Memorial Public Library provides people of all ages with current information on topics related to work, school, and personal life; encourages self-directed growth and development; addresses the need for reading and enhancing daily life through the use of library services and community interaction. The Board of Trustees meets the second Tuesday of each month and special meetings are announced in the Tri-Town News. All board meetings are open to the public.